I was in such a rush this morning- between finishing 2 assignments (referencing is the bane of my existence), showering, making lunch, and commuting to school – I had no time to come up with anything special (or so I thought). I knew I needed to start eating the spinach I bought (there’s so much), so I built up from there. 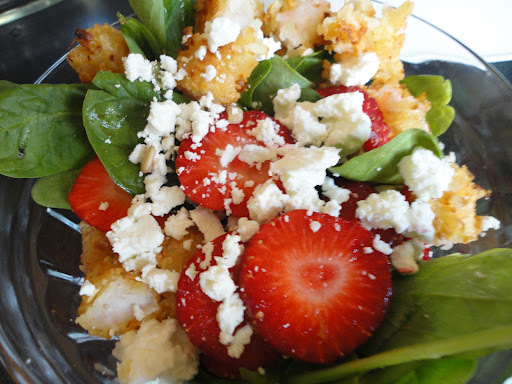 I’ve never had fruit in a salad (really), and my mom bought some strawberries so I thought I’d experiment so I some in, and I wanted protein – so I added (my current obsession) coconut shrimp. I wasn’t too sure how the flavour combination would turn out – but it was quite delicious! I think I have a winner here! I’m more a go-with-the-flow person, so I added in how ever much I wanted. How often do you come up with recipes on the fly?